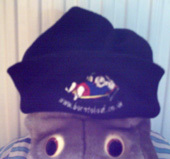 The borntoloaf.co.uk daily competition UK has been running since 2002 and winners have received free prizes ranging from cash, shopping vouchers, fleece jackets for adults and children, adult sized bath robes, rugby shirts, t-shirts for adults and kids, mugs, teddy bears, pens, stickers, badges, golf balls, golf tees, gadgets, computer games, ski hat, plaque, jigsaw, mousemat, karlascreativecapers art print, golfing sized umbrellas, and much more. Enter Here. Help me to choose a competition prize. 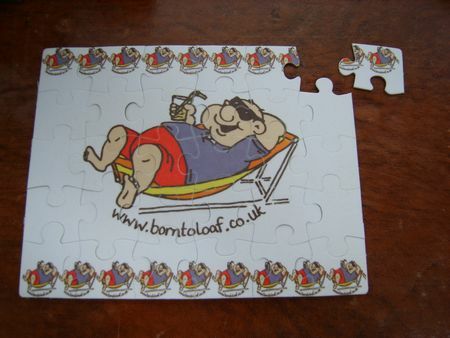 The borntoloaf daily competition is now being run on twitter @borntoloaf with a range of prizes. 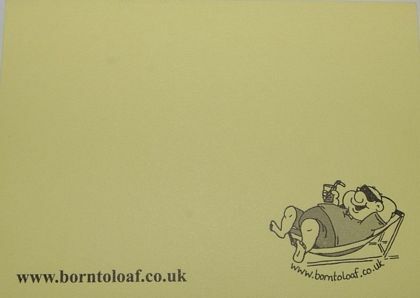 Enter the Born To Loaf caption competition. Here are photos of the prizes available. 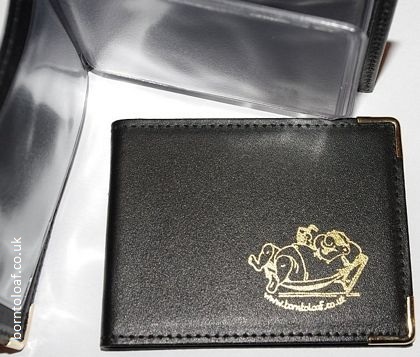 The credit card wallet has six compartments and is black leather with a gold metal trim. 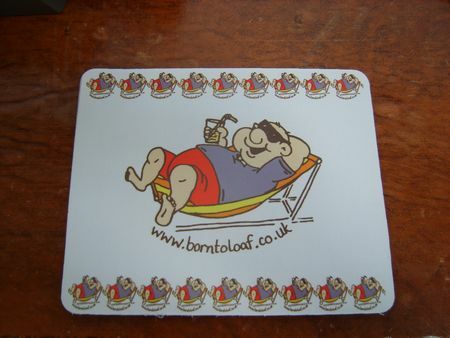 It is embossed with the Born To Loaf logo. 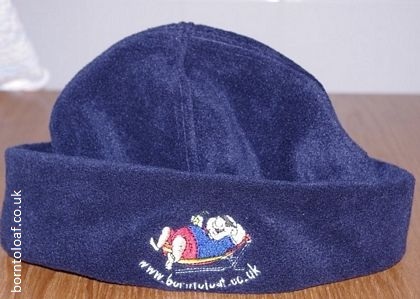 TheAdult Fleece Ski-Hat - one size fits all! 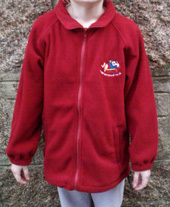 Made of really soft material, cosy and warm. Machine washable. The Born To Loaf pens are easy grip and lovely to write entry forms out with. I've sprinkled them with magi pixie dust to bring added luck! 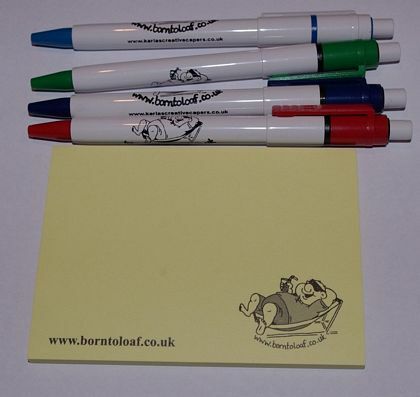 The Born To Loaf stick it notes are handy for adding to eBay parcels when you sell your unwanted prizes. Each packet of stick it notes contains about 50 sheets. We usually send several pens and at least one packet of stick it notes per win. 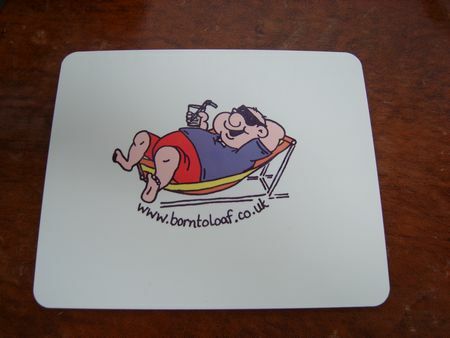 Enter the borntoloaf birthday Online Competition. My favourite gift has to be my ball point pens! Why? I hear you asking - Because they are mine! No one would dare pinch them! Any other pen left on my desk just walks, but my good old B.T.L ones sit there proudly! I look forward to your emails with your money saving gems! Well Congratulations on 5 years! I look forward to the next 5! These prizes are waiting to be restocked and the following is for information only, please do not ask for these prize items just yet. 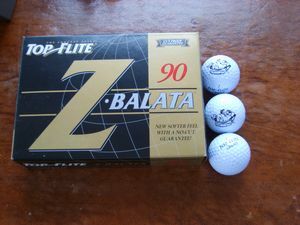 One box of six Top-Flite Z Balata Golf Balls (out of stock). 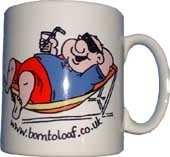 Mug with the loafer logo as illustrated (out of stock). 50 wooden golf tees (please note the tin in now unavailable). 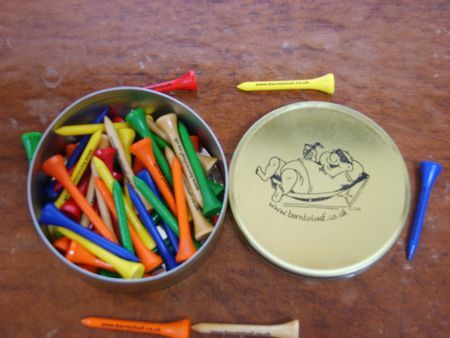 A round brass tin containing approximately 50 wooden golf tees (out of stock). Calendar Calculator - battery operated, display the year, month, date, week and time. World time for 16 cities, A countdown timer. An 8 digit calculator function and a currency exchange function. 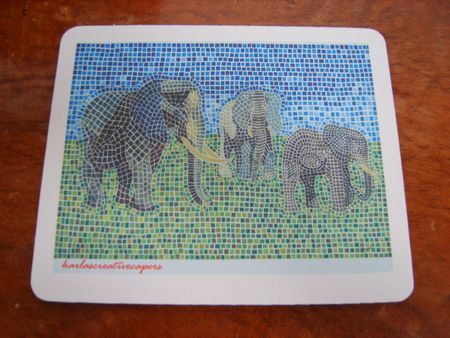 elephant mousemat (out of stock). Fridge magnet (out of stock). Wall photoplaque measuring 5 x 7 inches (out of stock). Clearway Wallet Ice Scraper - a slim ice scraper designed to fit into your wallet. Pincard wallet - allows you to remember all your secret pin numbers in one easy single secret code. A medium sized Parrot T-shirt based on the art print at KarlasCreativeCapers. 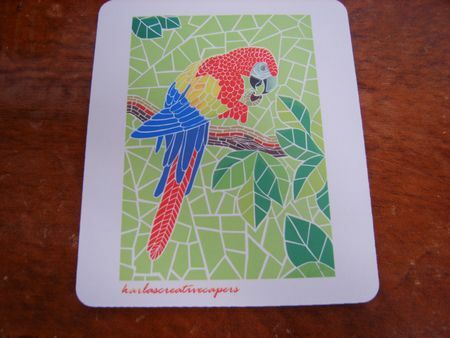 A choice of one signed limited edition mosaic art print of either an elephant, parrot or Santa from Karlas Creative Capers. The following are new and unused and can be chosen instead of Borntoloaf goodies. Two Black Inkjet Cartridges suitable for use with stylus colour 480/480SX/480SXU/580/C20UX/C40UX/C40SX. One Canon BC-01 Black Inkjet Cartridge. *We unable to exchange clothing because of wrong sizing. 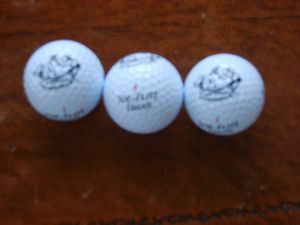 The sizes stated at the site are for guidance only. All daily competition prizes are subject to availability and non-exchangeable.